The birthplace of Western development in Port Stephens. Old Tahlee House has a pleasant outlook over gardens and water ways and was an official residence in the early days of the Australian Agricultural company. The very first house had a fire and was rebuilt. It had passed into private hands in 1856. Remnants of Kitchen and servant quarters as well as a cellar exist from those first days. The Tahlee Bible College now has the estate and is interested in the heritage and conducts guided tours. More information is on their web site here. A former owner had been very interested in establishing a beautiful garden and in entertaining guests. They journeyed there by water in a steam yacht to moorings in a quaint little harbour then up the steps and terraced garden to join the party. The AA Company was quite active in the settlement of the colony. The Australian Ag was formed in England by the big end of town in 1824 with the prospect of a grant of one million acres from which to reap exports from the new colony. Tahlee was the focus of one such vast property. The hills, the forrests, the cedars, lakes and wonderful river valleys were handed over by the Worimi people to the Agricultural company in 1828. The 'expert' adventurer, Dawson was in charge of the development. By horseback his group travelled up the beaches from Newcastle to the bay and Dawson went to the northern side as the desired location for sheep raising and fine wool. Tahlee was the gateway somewhat in the path of the southerly weather. The Arctic explorer, Parry, was the next appointed commissioner and his previous xperience was transferable, we hope! However, the land was unsuitable for sheep grazing and stock was eventually moved to more suitable areas inland. Stroud was one village among the local develoment. It wasn't easy to fine enough settlers and labour was scarce. Coal and minerals deposits were investigated. 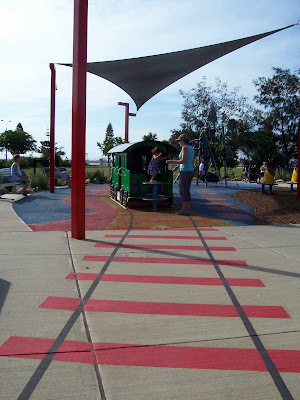 Road and rail links were envisaged but did not proceed. Overall, the venture enjoyed only limited success at this site. In 1849 the company ceased to use Tahlee house and it was sold to Manton in 1856 and the lands were eventually sold. From the old homestead down to more of the Bible college and the hall painted green. A swimming pool is on the shores. A path from Tahlee house leads down to a tiny boat harbour lined by stone work carefully built in the early days. The college would be reminiscent of any church mission in some far flung country in its collection of ad hoc buildings and idiosyncrasies typically found sitting in an idlyic location. Times change and the Bible College is setting up an accredited language school for teaching English to overseas students in what is a competitve market. The country lifesyle and water sport has something to offer them. Other church activites and camps are undertaken on the campus. The Hall. This is of interest to those who knew Greta Migrant 'Camp' (for post-war immigrants). No mean feat, the hall was moved from the Migrant camp, several hours drive away, by groups of volunteers using their vehicles to get it there. In reassembling, the arrangment of the windows has been changed. Curiously, the admin office is on the stage! The locality was called Carrington. Out beyond the Bible College, nearby, is a group of houses and an oyster farm. A happy Labrador was 'fishing' off these old timbers. A little church was built here very early on. It became a youth hostel. Leaving Tahlee is a subdivision where most of the land has been zoned non-urban and regular sized buildings or occupation has been prohibited. It appears to continue to be bought and sold. North Arm Cove in the same area is a more recent village resting by the shores like a ghost town on this particular day. Close by is the site of a grand plan for Port Stephens city prepared by Walter Burley Griffin (American designer of Canberra). Two thousand lots were subdivided on the ridges of a modern metropolis with glorious wide and curved streets and public spaces approved by Stroud Shire in 1918. A rail link was envisaged to go with this proposed major port and naval base in the name of commendable decentralisation. But before too long it was decided that a port so close to Newcastle was economically untenable. Pindimar, to the east, on land from the AA company, also had big plans for a city by Walter Scott-Griffiths but they did not go ahead either. Biding their time? The data is from works by Armstrong (1996) Fraser (2002) and Goold (1981). King Edward Park has a steep and winding road. Here is the gardener (driving a 'Gator) imagining he is in a hill climb event. The Car Club does have an annual Hill climb with cars sliding around here or close to the edge of the cliffs. Most other days it is peaceful. The public has limited car access to this fun drive now that too many fears are held about safety. Some boulders get loose at times. Horse shoe bend (and sunken garden) was formed by convicts in the time of Major Morisset who probably wanted a path to his swimming pool which is close by and was mentioned in the previous post but the historian, Goold (1981) described it as the first attempt at beautification in the settlement. The park is also the scene of outdoor movie evenings. When the beach is closed because of dangerous surf there's always the Bogey Hole instead in the rock platform below the cliffs. Heavy surf yesterday pounded the rocks and it wasn't even high tide. The power was awesome; the treacherous water inviting. Above: the southern end of the old pool. Some parts of our environment are almost permanent. The pool was built about 1820. 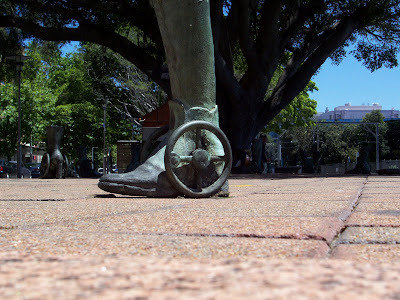 In the steps of Major James Thomas Morisset who had the pool cut out of the rocks by convicts around 1820 . It was know as the Commandant's Bath for James' personal use. After swimming, kick-back at the Bogie Hole Coffee Lounge corner of Hunter and Pacific street, where else?. Vocab: Bogeyhole, bogie: slang: a swimming hole. 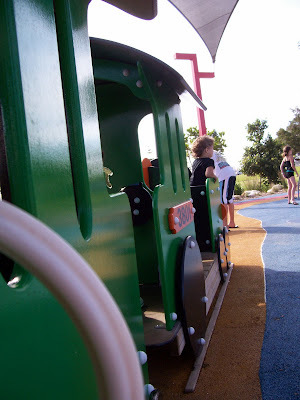 Also means snot, also bogey man, boogie-man, bogey as in golf and bogy wheel as in trains. 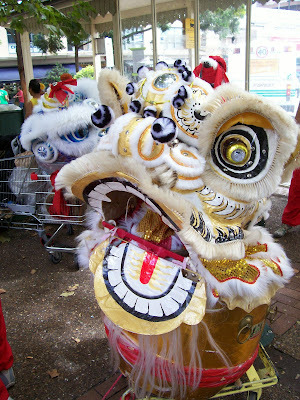 Half-hidden Chinese dragons crouching in a shopping trolley after a New Year's performance. Waratah Bowling Club last year. Now it is deserted and closed and boarded up. Some said that a sports club was moving there or a church club or a migrant centre. I believe bowling clubs occupy public land so would go to some good public use or revert to parkland. This was unearthed on a building site at the Harbour. I think it is part of an old tug boat or a life boat. This is probably Fletcher in Fletcher Park, Newcastle. The legend has stepped down. Fidel Castro led a unique country for half a century. We hone in on the personality and style of our political leaders. Government and other institutions are a joint effort not just any one person. There are those who spend several years politicking about individuals yet still end up with a bizarre leader. All the while the public service grinds on regardlessly. Is federal government redundant? 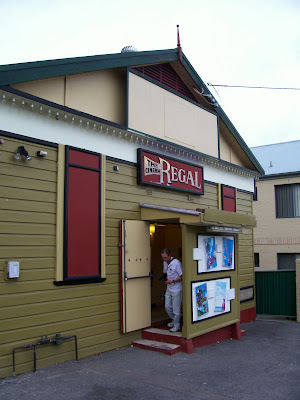 This little cinema, the Regal, was run for a long time single-handedly, and, understandably, that could be one reason why it closed in 2006. My list of highly impractical dreams once included that of running a small art-house cinema. That aside, moving right on, a community group has formed to re-open the cinema again in Birmingham Gardens. A fundraiser film night is organized for 7pm, March 10th at the Showcase Cinema in town. See FriendsoftheRegal.org.au or contact Jesmond Neighbourhood Centre Inc. in Jesmond. I believe a number of classic big old cinemas in the country towns have been given some recognition and assistance to enable them to keep their doors open a little longer and keep the tradition going. New Year Celebrations. 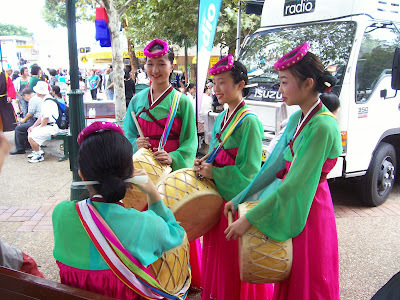 Petite Korean women with drums. An unexpected boisterous tradition and a skillful one at that. Webers Circus is in town until March 2nd, they have a colourful web site here. The circus is next to Newcastle Showground in Chatham Road. Here they were organizing the tent. It was a team effort. Are the supermarkets diversifying even further! See lower photo of machinery. Koori Art Mural from Kurri Kurri township. The black and white figures signify reconciliation. The Prime Minister will issue a formal national apology to the Stolen Generation of Aboriginal and Torres Strait Islander Australians who were removed from their families and communities as children. Tomorrow, Federal Parliament will be the scene of this momentous occasion. This outdoor mural shows the nearby Sugarloaf Mountain range with the sun rising behind. The tree has seen the changes in the land over the years and the dots above Wallis Creek depict the path that the Aborigines travelled in their search for food. The black and white figures signify reconciliation. Mural designed and painted by Les Elvin and students who attend Barkuma Neighbourhood Centre. Oct 2004. Engine 3801 at the Foreshore, Newcastle. This is my first sighting of this type of car, whatever it is, just visiting the supermarket. It needed twice as much space as the typical RV next to it and in one sense it's not even stretched. Demolition derby. This was the State Dockyard in an earlier life and is undergoing change. Photography at its worst? Potatoes or spuds or praties must be in short supply or have become unfashionable or has McDonalds cornered the market. The price has tripled. The drought and the floods would have an impact although the price has climbed for some time now. Potatoes were a good old staple food with vitamins minerals and charbs. I believe they are a reasonable source of Vitamin C and are ahead of a rival - white rice - in that respect. Potatoes were one of the basics that those on a tight budget would eat and enjoy and were inexpensive for quite some time. Chips are always popular. This was a quick photo stolen in a duopoly supermart. PS the following week, as is usual, what seemed to be the same potatoes were $1.96. Another variety was seen at $3.96 kg. 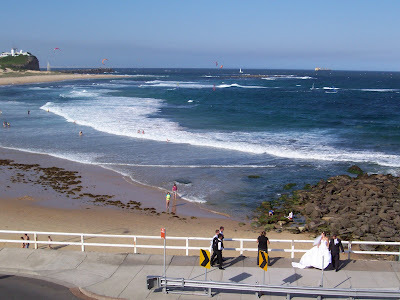 Newcastle Beach. The sun usually sets in the West here!! Can we accept our past - warts and all - our policies, our buildings? Do we change things? Some news arrived from a globetrotting relative in Phnom Penh, Cambodia. One small point. When I looked up my old travel guide it became clear that the streets there had been renamed to their pre-1970 names. Rightly, the dreaded Khmer Rouge had to be supressed and Quai Karl Marx, Lenin Blvd, USSR Blvd had to go. Nostalgia would be unthinkable? We are able to plan and change our city precincts so that they pay for themselves with commercial ventures. Depending on one's mood, sometimes a visitor may like to enjoy the sights without intruding on restaurant clientele or having the absolute waterfront residents somehow hovering overall. Depends how the mood takes one. 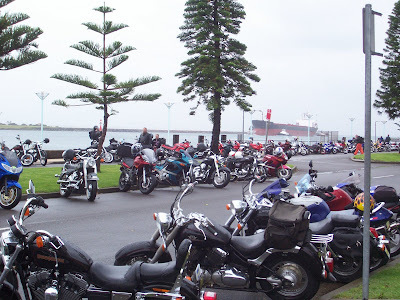 Photo of an earlier Toy Run bearing gifts for the children of Newcastle . Thinking of choppers, what was the destination for the bikies in Easy Rider? The Mardi Gras in New Orleans...where they wander the parade filled streets only to find their triumph is subverted. Mardi Gras Day is really on Tuesday, variously known as Shrove, Pancake or Fat Tuesday, the celebration before Lent, forty-six days before Easter. Easy Rider has been deemed a significant film, a window on the 60's, of hippie counterculture and of red necks. This home-made, aging, anti-extravagant film is about two non-conformists who believe in goodness and ride customised Californian choppers searching for the 'real'. Often 'stoned' they roll on a journey of discovery eastward from LA to meet their show-down and the price they pay for being different. To rehash more from Imdb.com: Dennis Hopper won best new director. The cinematography is praised and so is the music, one of the first movies to use previously recorded musical tracks: Born To Be Wild etc. Jack Nicholson (as a lawyer) got a nomination, thankfully, at a time when he doubted his acting career. Captain America (Fonda) is said to have been an experinced motorcyclist hence his chopper is more extreme than that of Dennis Hopper who was less experienced. Four police bikes were customised for the film, one was burned during filming and the other three were stolen, no less, before the end of the filming. As a passenger, Nicholson broke Fonda's rib in the process of trying to balance himself because the chopper was so 'squirrely'. Is this film a cult-classic with its share of excitement, edginess and risk? Yet there's more. The Carnaval in Rio is the backdrop for another ancient yet different film, Black Orpheus, filled with jubilation and malevolence and original Latino music. What do others say about the city? In the earliest days of the colony Newcastle was nicknamed 'hell' by the convicts (wikipedia). I believe 'like Siberia' was another description. Wrong again! Mark Twain visited Newcastle on a lecture tour and was not impressed. Well, things have changed (for the better). Taking the plunge?For Valentines Day.